It’s certainly been a while since my last post but there has been no shortage of action in my life since then. After an extremely stressful year in my career, I am very happy to say that I have moved on to a new opportunity that has already begun to teach me new things, all while being surrounded by an energetically wonderful group of people. I’ll certainly miss some of the relationships I made in the past year, but knowing they are only a phone call away brings great comfort. Of all the changes and decisions made between this year and the last, I think the most difficult one was agreeing to close down “Gift With a Pink Ribbon, Inc” also known as “Knots4Comfort”, the nonprofit organization I created only a few years ago. It became increasingly difficult to raise money for the cause and unfortunately, many individuals also tried taking advantage of the program/cause sending in a slew of requests to get “free” blankets, forcing us to change the way we filtered requests and distributed the blankets we made. Still the cause is a great one so I definitely plan to make and donate more blankets in the future on my own accord, and I encourage you to do the same if you feel it in your heart to do so. Local hospitals and treatment centers are always willing to accept these donations and it is guaranteed to make someone’s day. So I leave you with these words this beautiful Saturday morning… Live your truth and live this moment, for you never know what tomorrow will bring and tomorrow is already a thing of the past. The start of our relationship five a half years ago was all exciting and filled with never ending rainbows and everything in between, but after only eight months into our relationship came the fateful news of my first breast cancer diagnose in 2013. It literally felt like a ton of bricks that came crashing down on our glass house. We didn’t even know how to share the news at first. And while we knew it was certainly going to be a journey full of ups and down, we ultimately just wanted to live our lives not always having to think about what was happening, seeing as it had already begun to consume much of our time and energy. Luckily, we were blessed with an incredible support system, since both our families and friends swooped in and filled us with so much light and love. It still brings me to tears to think of how much support we’ve had throughout the years, even from all the new friends we’ve made along the way. To be honest, that’s a loaded question. It’s been six months since my last blog post, yet it feels like so much less despite how much has happened since then. I suppose I can start by sharing that I recently got a promotion and am now working at a new property as the general manager of a residential condominium located in Miami Beach. I honestly couldn’t have asked for a better welcome from my residents, in-house team, and corporate team members. I have learned so much about myself, and from those around me since I’ve been there, and I look forward to learning so much more. I’m also still attending school with my graduation date just around the corner which is super exciting. That brings me to my birthday which just passed in May. I was so happy to be able to spend it with my family this year, including one of my nieces who I hadn’t seen in ages. It was the greatest gift I could have ever asked for. 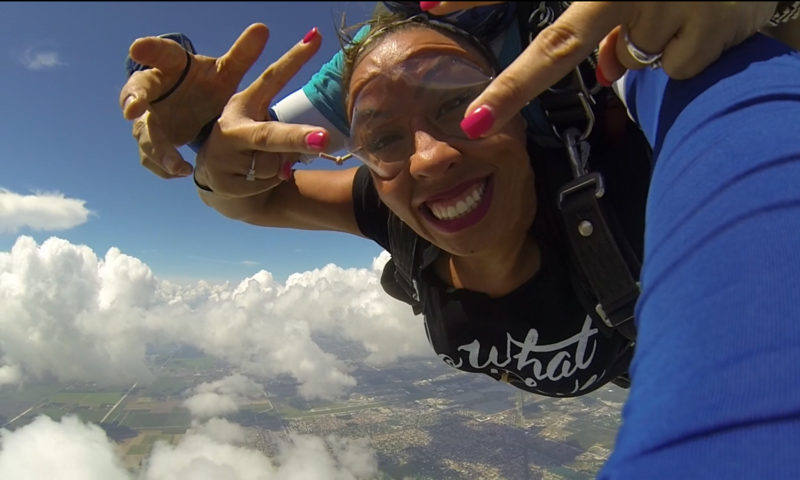 And as if that weren’t enough, the following week I got to check off one of the items on my bucket list… Sky Diving! What a liberating experience!! But that’s not all, which brings me to the rebranding of Gift With A Pink Ribbon, Inc. What started as my personal blog, morphed into a non-profit organization focused on bringing comfort to patients undergoing chemotherapy treatments. This part of my journey has been great, but as the years have gone by, it became clear to me that Gift With A Pink Ribbon, Inc., the non-profit organization, needed a new name so that I could continue to share my personal journey under my original name of “Gift With a Pink Ribbon” without steering the focus away from our non-profits mission. So, without further ado, I welcome you to visit our new website, www.Knots4Comfort.com. Yes, our name has changed but our mission remains the same, “to help cancer patients undergoing chemotherapy find comfort and warmth during their treatments”, and I know that with your continued support, we will be able to raise enough money this year to resume the production of our blankets. It is with much gratitude that I thank all of you who have followed me since day one and inspired me to continue my journey living every moment to it’s fullest. And to those who have joined me along the way, I thank you as well because you have helped remind me of my purpose in life and for that I am eternally grateful. There are truly a number of things that I am thankful for, especially my continued good health. Just a few weeks ago I celebrated the 4 year anniversary of the day I was first diagnosed with breast cancer, and though I was diagnosed again about a year later, I am happy to say that I have been cancer free ever since! Strangely enough I still find myself adapting to my new “norm” but all in all I feel great, and far more in tune with what I want to achieve in this lifetime. I’ve kept very busy with work, Gift With A Pink Ribbon and school, and it is all bringing me closer to doing what I love most, and for that I am extremely thankful. But none of this would have been possible without the love and support of my family, friends and the big man upstairs, who always finds a way to keep me grounded. So while there are a million things that don’t always go my way, like my participation in the New York Marathon that I had to postpone, there are a million and one things that go exactly as they should, even if I don’t always see the moment in which each puzzle piece falls into place. Wow, it’s been 3 years! Here I sit working on my studies when out of nowhere I receive a Happy Anniversary message from WordPress. I can’t believe it’s already been 3 years since I posted my very first blog entry! Where does the time go? It’s been several months now since my last post and as crazy as it sounds I feel like its only been weeks. I’ve kept busy with work, Gift With A Pink Ribbon, training for the New York Marathon and School just to name some of the big things that are keeping me on my toes, but in light of the message I received I wanted to take a brief moment to truly thank everyone for all of your support. Its thanks to all of you that GWAPR exists now as a nonprofit organization, donating blankets to cancer patients undergoing chemotherapy treatments all throughout the US. Just this past April we were able to send blankets to the Moffitt Cancer Centers for their volunteers to deliver to the patients currently undergoing chemo treatments. Our next step will be the Nicklaus Children’s Hospital right here in Miami. I can’t wait to deliver all of the colorful blankets we have created so far to the children receiving treatments! My days are long, and sometimes I even feel like I don’t have more to give but there is one thing that always keeps me going….. The smile that comes to the faces of each person that receives one of our blankets. Just knowing that we are brightening someone’s day makes every hour spent on our mission worth it. In the package I recently received was a beautiful rose quartz cuff bracelet from an incredibly talented and inspiring young woman named Kaliada, and a special note too. I must say however that this particular note in itself was a gift. Not only did Kaliada gift me one of her beautiful designs, she also took the time to make me feel incredibly special by acknowledging all I’ve done with Gift With A Pink Ribbon, and what I’ve gone through in my journey. The acknowledgement alone is a gift in my book. What makes this extra special is that she herself has experienced cancer first hand, and through her very own journey discovered her gift for creating beautiful pieces of jewelry. I admire her dedication to empowering women to feel beautiful and confident after cancer, regardless of their emotional or physical scars, and I love that gives back by sharing her own journey. I am humbled to have received one of her pieces, and will forever be reminded of her kindness, and her incredible journey each time I wear it.